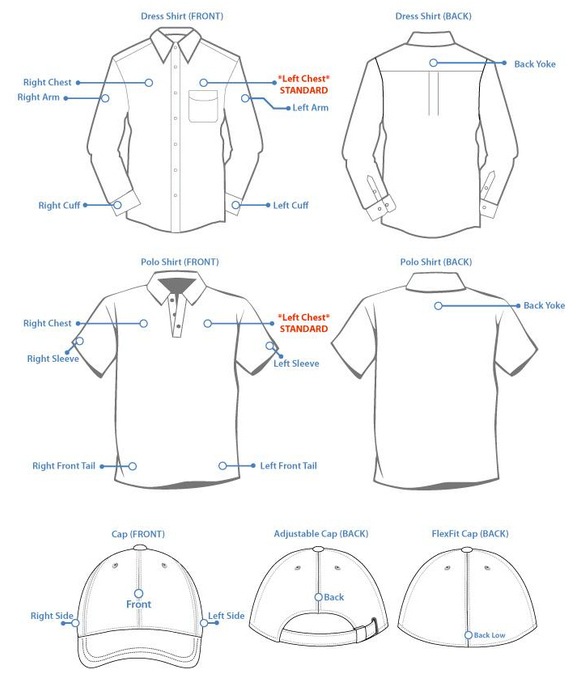 The most common embroidery placement is LEFT CHEST. See below diagram for other options. Free proofs are provided within 48 hours at no cost. Acceptable file types are jpeg, pdf, ai, eps, psd, tiff, or gif. The maximum logo size for a left chest logo is 4" x 4". We will make your logo at an appropriate size to make your items look professional. All custom order require quoting. After submitting your order you will be emailed a preliminary logo proof and quote within 48 hours. Feel free to make any modifications until we get the design to you liking. At acceptance a final proof with thread colors will be sent for final approval. Logos are then kept on file for you to use at any time with no set up fee.